If I could give myself a slight pat-on-the-back for something this year, it would be that my coffee consumption (and let's face it... usually not straight-up kind but mixed with sugar and some kind of faux milk) has gone way down. 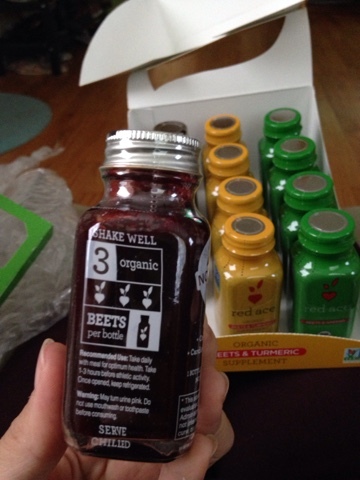 That doesn't mean I don't want an energy boost to fuel the daily grind and toddler-chasing, so when I was offered a chance to try these Red Ace Organics beet-juice shots, I went for it. Truth be told, while I will eat beets, I can definitely live without them, but in this form, I could reap some of their benefits in a concentrated form. I tried the "Greens" version first, though it also comes in straight-up Beet flavor as well as Tumeric. 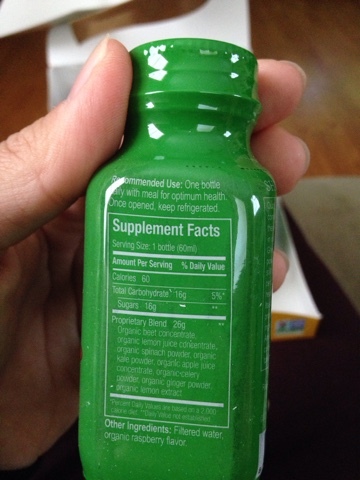 The greens, as the title suggests, has spinach and kale in it, while the turmeric serves to combat inflammation. They all taste the same, in my opinion, which might be a good thing. I stored these in my fridge, because they are most palatable cold. Each one has a slight tang to it, kind of like when you order a veggie juice. It's slightly viscous (and I'm not a big fan of viscous drinks unless they are smoothies), even after shaking, so I don't think I dwelled on the flavor as much as I could have just to so I could finish the drink quickly. Overall, it went down fairly easily. As a warning, though, these didn't sit well for me on an empty stomach, so I'd recommend having it along with, say, a healthy breakfast. As for the energy factor, I did notice that my usual mid-day slump would happen later than usual. I'm pretty sure my slumps are just impossible to avoid, but I guess it's better to run on beet juice than syrup and coffee. I'd definitely recommend anyone avoiding stimulants to give this a "shot." At the very least -- hey, there are veggies involved, which is usually a good thing. 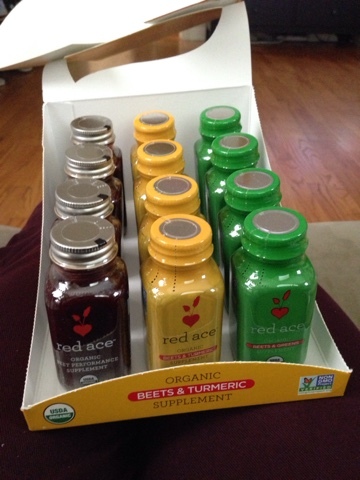 FTC Disclaimer: I was provided samples of Red Ace Organics to review in exchange for my honest opinion. It seems like I keep falling off the blogging bandwagon, but like running or other exercises, I keep trying to hop back on it. The daily grind and my general forgetfulness have resulted in me "forgetting" one of my favorite past-times. Speaking of favorites, Tuesday is definitely doing a lot of growing up lately. He is so verbal, and I think we're finally approaching a stage where we can really play and communicate with each other. Being able to understand (some of) his needs is huge, resulting in less frustration for all involved. In about a month, Tuesday will be turning 2, which is kind of mind-blowing since it has flown by just like everyone says. I've been very good about being active regularly, although not-so-good at doing many of the things I used to do for exercise. Mainly, I used to (even as late as Spring) run more often and for longer distances. These days, while I do get out there, I take breaks a lot more often because my mental willpower isn't what it used to be. I've gotten a lot better since the weather started to bob into more Fall-like conditions more recently, so hopefully that gets me on a better path soon. The race that I did not get to run due to a last-minute cancellation is rescheduled for early March. I waffle between withdrawing my registration (grandfathered in), trying to train again (ahhhh), or winging it (even more ahhhhh). Maybe the new year will give me a motivational boost. Besides running, I actually finished Insanity Max 30. Of course, not all in a row like it's supposed to be done, but every workout nonetheless. I crammed some of the last workouts together, and boy, if I had done them on the correct schedule, I probably would have seen some good results. I know I haven't finished reviewing each of the workouts. Maybe eventually. Now I'm doing the same with Focus T-25. Then finally, I've been trying to keep up with the weight-lifting aspect of fitness. I've kind of stagnated there due to my lack of visits to the gym. I usually only do about 20 minutes, twice a week, usually after a little running. On "leg day" (in quotation marks because it pales in comparison to what it needs to be), I usually do leg presses (I am hovering at the 200-lb point), leg curls either sitting or laying (35-ish pounds...weak hamstrings! ), abductor/adductor (about 130 lb for both by the time I max), and then I'll do wall-sits, squat pulses, or single-leg squats on the TRX (suspension area). On "upper body" day (should probably be separate arm/chest/back days), I usually end up doing lat pulldowns (maybe 70-90 lbs depending on how I feel that day), rows (maybe 55 lbs by the time I max), and then random stuff like lateral raises, rows with free-weights, or shoulder presses. My upper body, as large as I often perceive it to be, is my weak area. Carrying around a 30+ lb kid helps, but sometimes I think it's just my legs benefitting from that. I'm hoping to update here more. I have some reviews pending, and life's going pretty well in general. Case in point: me and Nesquik bunny. I was the primary coordinator for our company's team at the YMCA Stair Climb, an event I've both participated in and coordinated twice. I decided NOT to participate this year, because coordinating was enough for me. It is a heinous amount of work for little recognition, so with any luck, I'll be taking a more minor role next year and not go crazy between July and September (although if anyone from my company reads this, I'm sure they will egg me on). Anyway, I'm off to unwind before bed. After a year-plus of sleep deprivation, I love being able to sleep decently most nights. It's something that I took for granted growing up but certainly as an adult, and especially now, I value it very much.